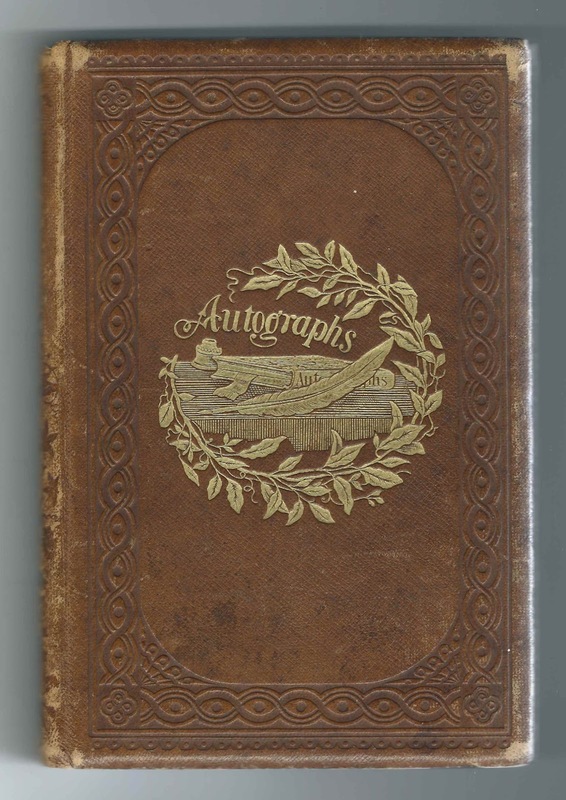 1863-1868 autograph album that belonged to Samuel Isaac Stein of Platteville, Wisconsin. The album measures approximately 8" x 5-1/2" and contains the sentiments of 77 of Samuel's friends in Wisconsin, Louisiana and Illinois, with perhaps some of them his fellow soldiers in the Wisconsin 41st Infantry. An alphabetical surname list and an alphabetical list of the inscribers, together with any personal information they left, appear at the end of this post. Two inscribers affixed their photograph to the page they signed. Samuel Isaac Stein was born March 24, 1839 in Treysa, Hesse-Cassel, Germany, according to his 1874 passport application. I don't have his parents' names. He arrived in the United States around 1860, not long before he started acquiring autographs in this album. He enlisted as a second sergeant with Company A of the 41st Wisconsin on May 5, 1864 and mustered out a sergeant on September 23, 1864. Samuel was working as a dry goods merchant at Platteville, Wisconsin at the time of enumeration of the 1870 Census. At some point after that, he married Wilhelmina Sheir, "Minnie". They had, I believe, two children, one of whom, Willie, died in childhood. Their daughter Katherine B. Stein outlived her parents; I don't believe she married. By 1892, according to pension records, Samuel had become an invalid. He died in 1913; Minnie died in 1928. If you have corrections and/or additions to the information above, please leave a comment or contact me directly. 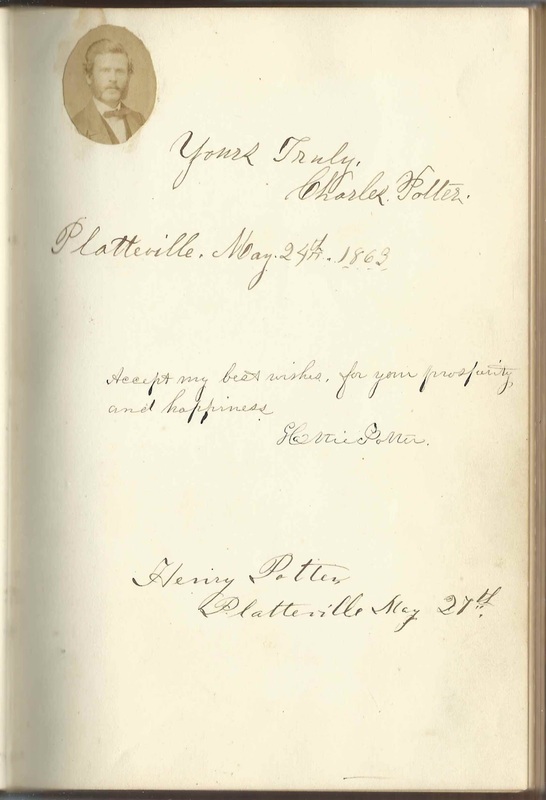 The page below was inscribed by Charles Potter, Hattie Potter and Henry Potter of Platteville, Wisconsin; Charles dated his inscription May 24, 1863. E. T. Mears and A. A. Mears of Platteville, Wisconsin, inscribed a page on April 12, 1866. They were Elias Tyler Mears and wife Agatha Ablett (Cattermole) Mears. 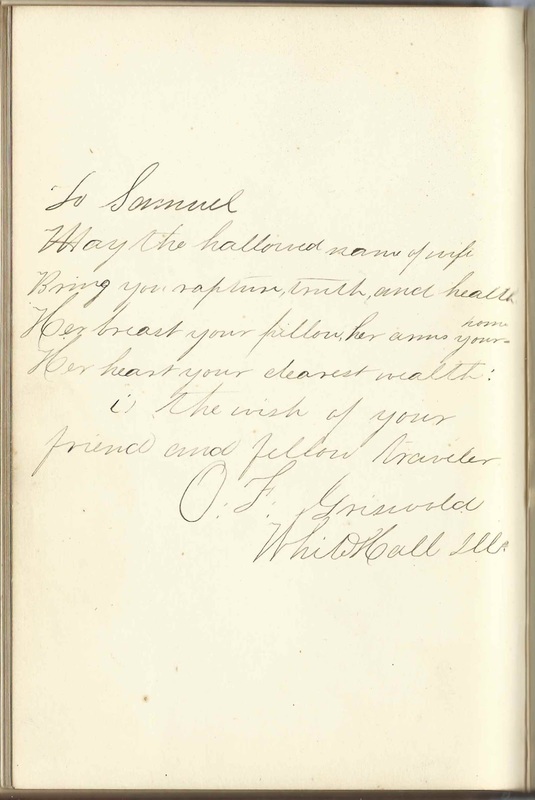 On the page that O. F. Griswold of White Hall, Illinois, inscribed, he referred to himself as Samuel's "fellow traveler". He was presumably Orlando F. Griswold. 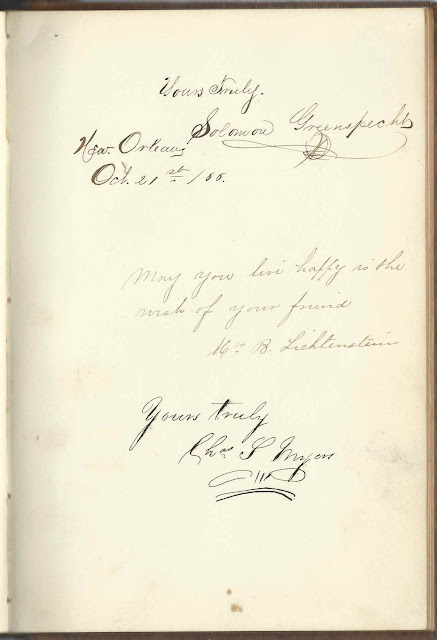 The page below was inscribed by Solomon Greenspecht at New Orleans, on October 21, 1866; by H. B. Lichtenstein; and by Charles S. Myers. 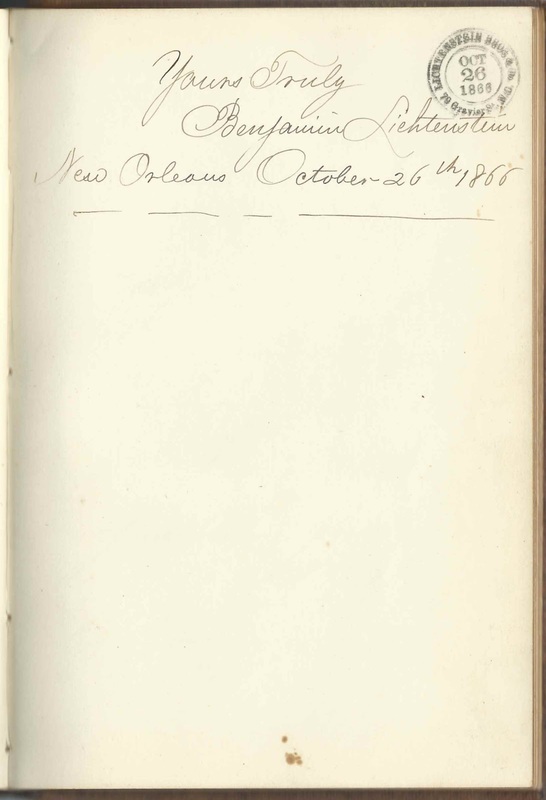 The next page in the album was inscribed by Benjamin Lichtenstein at New Orleans, Louisiana, on October 26, 1866. He date-stamped the page with the stamp of the family company Lichtenstein Brothers and Company at 79 Gravier Street, which I believe was a cigar and cigarette manufacturer. The Hodges family of Platteville, Wisconsin, inscribed a page: Isaac and Lucetta (Crist) Hodges and their daughter Emma O. Hodges. Alford Gray Katzenstein Paine Sheers ? Louisa Bartholomew, signed at Platteville, Wisconsin, on December 15, 1867. Shared the page with Cinnie Gordon. Susan S. Basye, signed at Platteville, Wisconsin, on July 16, 1863. Susan Eleanor (Slater) Basye, wife of Isaac Newton Basye, with whom she shared the page. 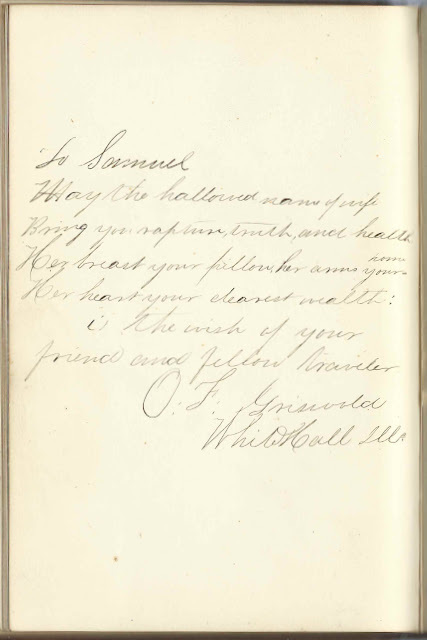 M. S. Burwell, signed at Platteville, Wisconsin, on January 1, 1864. Later note: "Died Jan 31/66". He was Minor S. Burwell, who died at age 20. Cinnie Gordon, signed at Waupacca, Wisconsin, in December 1867. Shared the page with Louisa Bartholomew. 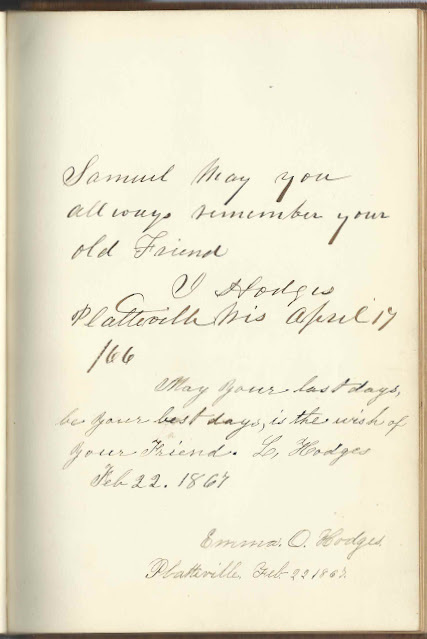 O. F. Griswold of White Hall, Illinois; "fellow traveler"
Emma O. Hodges, signed at Platteville, Wisconsin, on February 22, 1867. Daughter of Isaac and Lucetta (Crist) Hodges. Willard Jones, inscribed at Neenah, Wisconsin on June 6, 1863; he affixed his photograph. Benjamin Lichtenstein, signed at New Orleans on October 26, 1866. He added a date stamp for the Lichtenstein Brothers & Co., at 79 Gravier St., New Orleans. 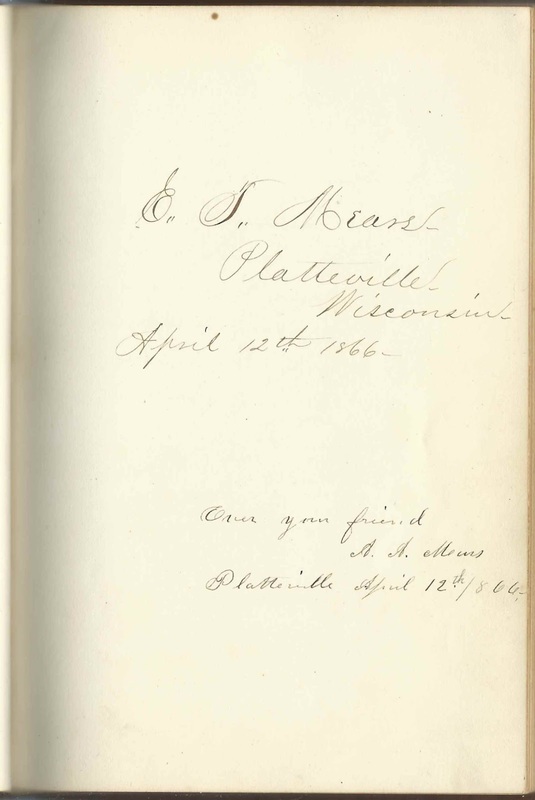 E. T. Mears, signed at Platteville, Wisconsin, on April 12, 1866; presumably Elias Tyler Mears. shared the page with his wife Agatha Ablett (Cattermole) Mears. Josephine Morris; shared the page with Nellie M. Morris and Maria L. Morris. Maria L. Morris, signed at Lima, Wisconsin, on October 5, 1863. Shared the page with Nellie M. Morris and Josephine Morris. 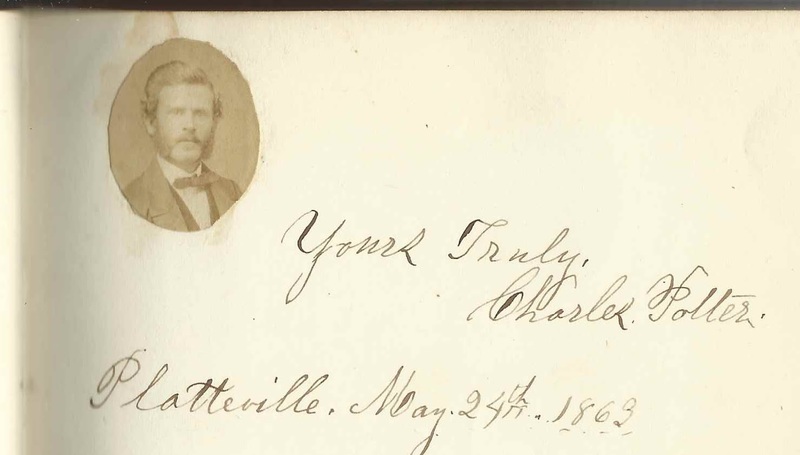 H. Olney Paine, signed at Platteville, Wisconsin, on August 18, 1863; presumably Hiram Olney Paine. Henry Potter, signed at Platteville, Wisconsin, on May 27 [no year written, but possibly 1863 which was the date used by another inscriber on the page]. Shared the page with Charles Potter and Hattie Potter. Carrie S. Prideaux, signed at Tafton, Wisconsin, on June 10, 1867. Shared the page with Julius Augustine. Amaret Rewey, signed at Platteville, Wisconsin, on February 28, 1864. Amaret (Bushnell) Rewey, wife of Addison Rewey, with whom she shared the page. Add. Rewey, signed at Platteville, Wisconsin, on February 28, 1864; presumably Addison Rewey, husband of Amaret (Bushnell) Rewey, with whom he shared the page. Willie Sheers, signed at Platteville, Wisconsin, on February 23, 1863; not sure of surname.